Look, I get that the show is titled “Boruto: Naruto Next Generations”, but does literally every older character in the franchise have to hammer it home with a “its the new younger generation’s time now”? That phrase is so frequent and the audience is so often bludgeoned with it, that I’m wondering if I’m actually supposed to take it as the joke that it appears to so unintentionally be. All ribbing aside, I actually really liked this week’s episode, a fact that I’m pleasantly surprised by. 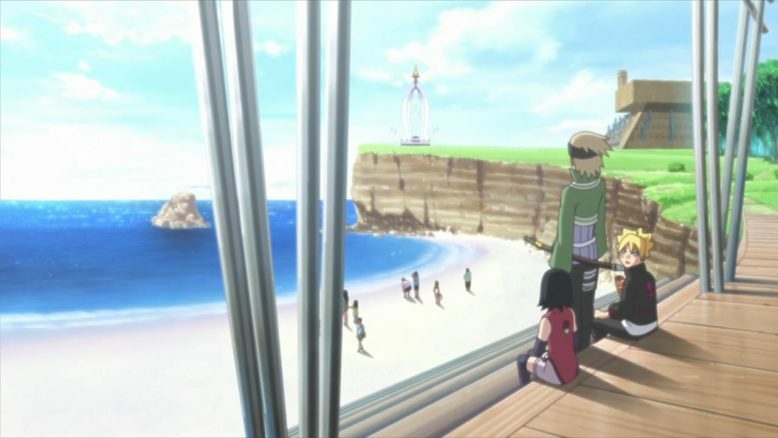 Rather than make this some boring comedy school trip for Boruto and co, the show is actually taking this whole arc as an opportunity to really explore the notion of peace and how it affects what is basically a warrior village in Kirigakure. It seems that Kirigakure (Village of the Hidden Mist) had a pretty horrible state of affairs until very recently, as we learn this week. On a side note, I think that that indirectly says something about the previous Mizukage, Mei’s leadership, if unintentionally. 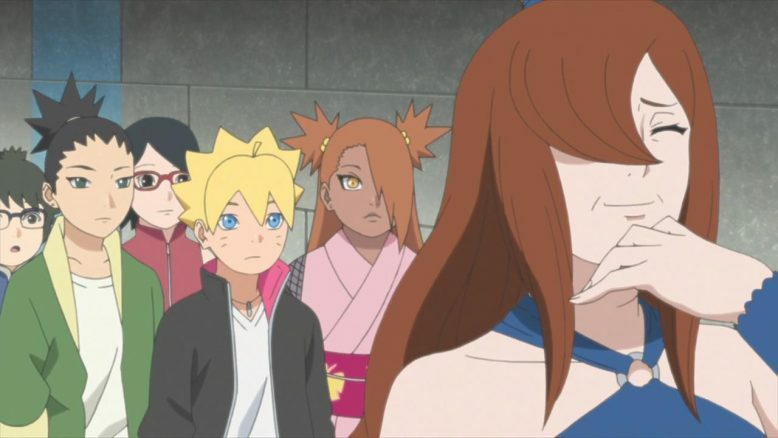 According to the episode, a lot of the progress for the village actually happened when the current Mizukage, Chojuro took over, and thus it seems like Mei wasn’t all that great of a leader beyond her ability to fight. It is worth noting that, for fans of the character, we never do get an answer for whether Mei actually found the man she was almost always looking for, in the previous series. If anything it seems like Mei is one of the forever alone characters of the franchise, and now kind of just hangs out in her village, similar to the retired Kakashi in Konoha. But moving beyond her, I am actually also pleasantly surprised at how capable of a leader Chojuro actually is. In the last series, Chojuro was a really odd kid and seemed like he was just following behind Mei as her second, aspiring to little more. It was really hard to picture him as a leader then, especially as someone who would be leading his entire village. 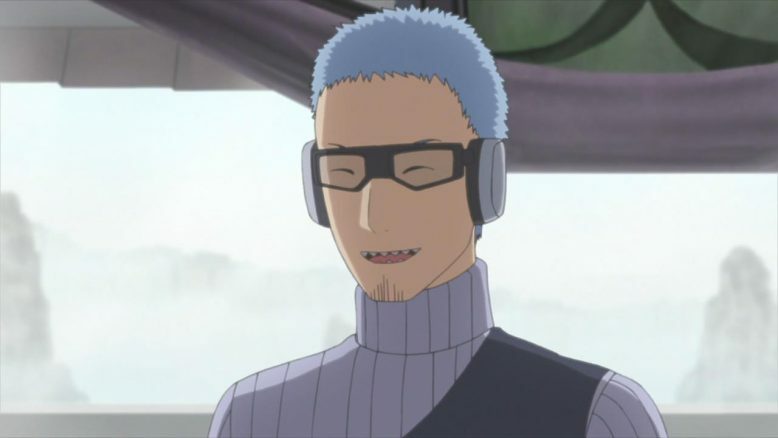 But much to the guy’s credit, the whole speech he gives to the visiting Konoha kids, especially the second version of it, is pretty heartfelt, mature and targeted to its audience. There’s a nice little scene where Boruto and Sarada start to argue about the speech’s contents, only to have Chojuro himself come in and salvage the situation agreeing that adults can complicate things unnecessarily. And speaking of Boruto and Sarada, man am I enjoying how the series is slowly (very slowly in fact) bringing the two closer together. 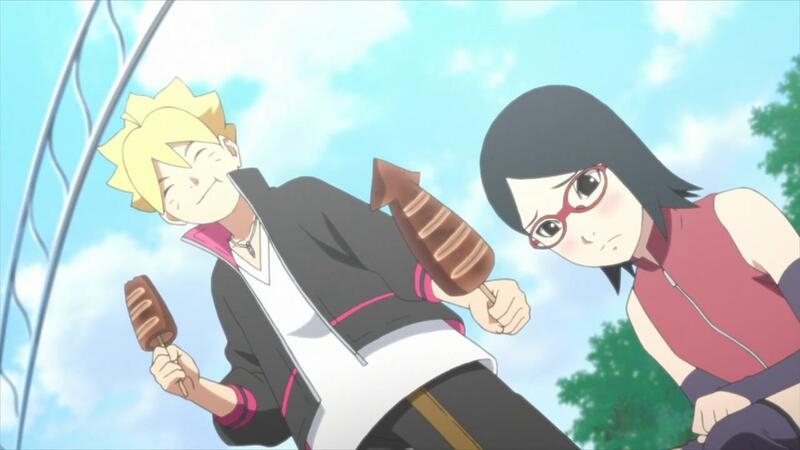 They’re not quit there yet, but Boruto and Sarada actually compliment each other really well. Sarada aspires to be both a leader and someone who cares about everyone in a similar way to Naruto. Sarada’s clever, but she hasn’t gotten to the warm, loving and caring part of the equation just yet. Boruto on the other hand, as much of a rebel as he is, is a natural when it comes to taking care of and connecting with those around him. That scene on the beach, where Boruto shared his food with Sarada, was a nice and touching moment. Is it too early for me to be shipping these two characters? Perhaps, but I’d be lying if I said it hasn’t started to form as a concept in my head at least. 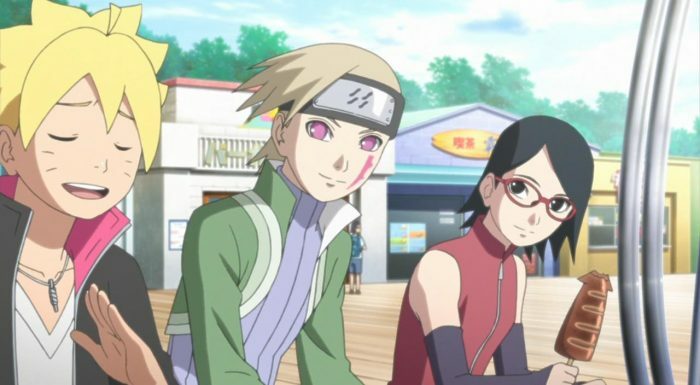 Of course while the Boruto, Sarada and even Chojuro/Mei parts of the episode were nice, they were little more than side attractions, little bonus bits even. The main attraction, was of course, Kagura and the history of the Kirigakure village. This is where I think the arc is really continuing to kill it. Damaged and traumatized pretty boy? Check. We have Kagura, a kid who’s really talented and nice, but who seems to be really afraid of leadership and his own past. We get mentions of the rather grim history of the village, particularly the academy graduation exam, which involved classmates ultimately killing one another and the few survivors being accepted as warriors. I’m not sure if Kagura was actually a part of this whole process, but it would explain why he keeps hating on himself and refuses to go beyond his current station. 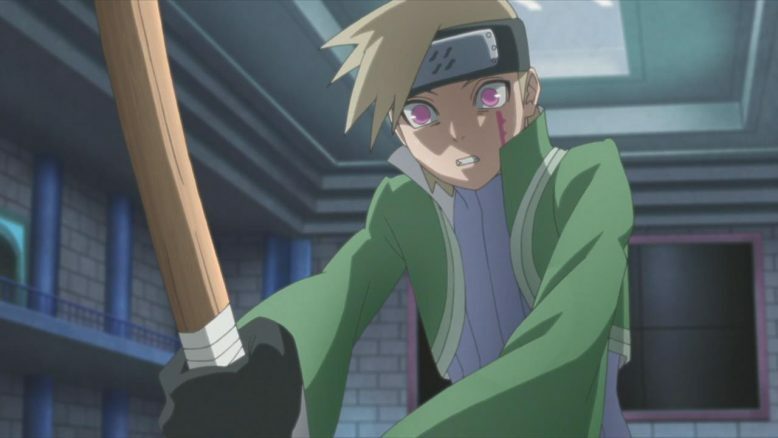 Its most evident in the sparring fight between him and Boruto, which has him dominate Boruto quite easily, only to recoil from getting far too into the fight as a whole. Kagura is someone who seems to have the natural born ability of a fighter, and that seems to be at odds with his current nice self and everything he holds dear. Kagura really likes the current state of affairs in the village, and its easy to see how he might view his own power and killing ability as something antithetical to the currently established peace. On the flip side of Kagura, of course, is most definitely Shizuma (and his lackeys). Its this particular group that seems to be determined to keep the old ways of the village not only alive, but ruin this new found peace that the village as a whole seems to be enjoying. 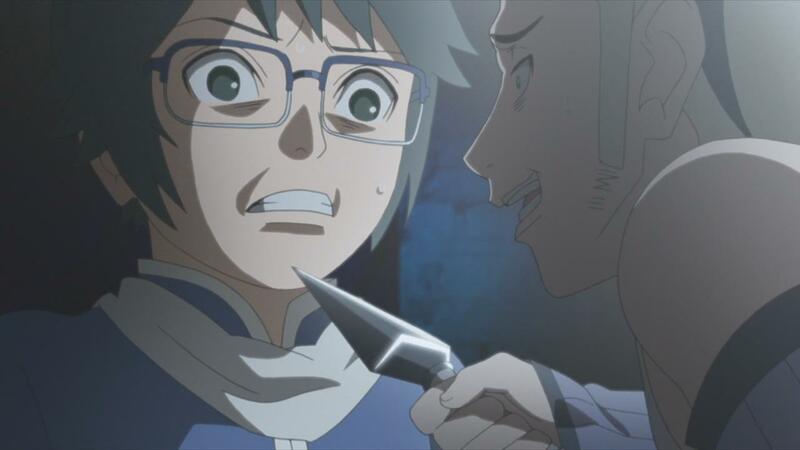 Enter Boruto, the son of one of the most famous Shinobi of the current era, coming to visit the village, and you’ve got a setup for a nice conflict there. Despite what Boruto would like to believe, by being the son of a leader, he’s got a huge target on both his back and the backs of his friends. Its not surprising, therefore, that people would target him to try and make some sort of political point. And target him they do, by kidnapping one of his friends and demanding that he come over to meet them. Its Denki that gets captured to that end, as the kid ends up walking back from a shopping spree alone and goes down a dark alley. As to why Denki was traveling by himself when common sense suggests that everyone on a field trip have a partner with them? Beats me. I’m willing to suspend a little bit of disbelief though, if only because the whole Kagura and Boruto versus the dark underbelly of Kirigakure is just so appealing as a concept. Is Denki the macguffin that drives Boruto and his close friends to act? Sure, but I suppose its okay because Denki isn’t about to do anything else now is he? Haha, see you all next week.